Everything that can go wrong will go wrong when our shadowrunners work security at a rock concert in our funniest session yet. For our third Shadowrun adventure I really wanted to try something different. Our previous mission was very combat heavy as I shuffled my runners from scene to scene as they made their journey to downtown Seattle. 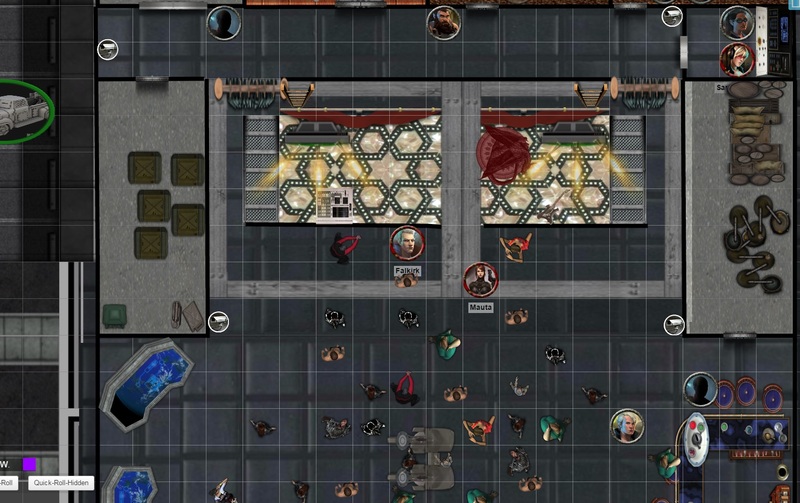 This time I created a single, gigantic scene in Roll20 where multiple events transpire – and only a few involve actual combat. In our previous session the runners had purchased eqiupment and scoped out the location of the warehouse-turned-concert hall The Dragon’s Maw. They’d been hired as temporary security guards to beef up the staff for an indie rock label and their star performing artist – Lana Grace. One night only, and anything can happen. As a GM I like to overplan as much I can so I’m at least somewhat prepared for any unexpected things my players do. I also shepherd them somewhat, and even within a single scene I had events happening all around them to replicate the feel of being part of a security team. Since the players all split up to handle different tasks and areas, I also switched around to make sure I didn’t focus on any one player or situation for too long, and made sure everyone got to do something. Before the opening band even took the stage I had a salvo of events lined up to take place. Most of them were just little side story kernels with a few notes. I was stepping a bit out of my comfort zone by having to ad-lib much of the specific dialogue and events, but it ended up being a hell of a lot of fun – I don’t think we’ve laughed so much and so hard in an adventure yet, and I was complimented on my voice acting (having a young child you read to every day helps immensely with this). The folks backstage had to screen backstage passers to get into see Lana, a fun an direct way to screen people and use skills like Perception to find weapons and Judge Intentions to see how they were acting. I planted some questionable folks, some earnest ones, and even a creepy vampire – whom was totally allowed inside and subsequently had to be fought and put down! The dance floor area involved people trying to sneak backstage (which lead to a funny confrontation between the unstable decker of the group), and a drug peddler that was high on his own supply. The players guarding the entrance had to deal with a ticket scalper. Most of these events were heavy on the role-playing and light on skill checks, and only the vampire ended up having any actual combat. It was a fun chance to let loose with some play acting and everyone ended up having a really fun time with it. Once the warm-up band took the stage I had a few more events transpire – like a streaker trying to run onto the stage. All these mini-events ended up taking up all our time for the session, and we ended before our star actually hit the stage. I was nervous going into this session how well this system of seemingly random events would pan out, and if I ‘d be able to handle multiple things happening at once with the party split up. It ended up working out really well, and I’m pleased to see everyone having fun on a much more role-playing heavy session. Tune in next time to see if any more shenanigans arise when the star takes the stage!